(AP) MINSK, Belarus - It's probably the first time in history that teddy bears have defeated generals. Belarus' authoritarian President Alexander Lukashenko has sacked two of the nation's top defense officials after two Swedish advertising agency employees piloted a light plane into the country's heavily guarded airspace, dropping 879 teddy bears decked out in parachutes and slogans supporting human rights. Officials in the ex-Soviet state denied the July 4 incident until Lukashenko called a meeting last week to scold authorities for allowing such a "provocation." The Belarusian ruler nicknamed "Europe's last dictator" on Tuesday fired the nation's air defense chief and the head of the Border Guards service and reprimanded several other top security officials, his office said Wednesday. Thomas Mazetti and Hannah Frey, the two Swedes behind the stunt, said they wanted to show support for Belarusian human rights activists and embarrass the country's military, a pillar of Lukashenko's power. "Hopefully, we've made people more aware in the world and that there will be more people supporting Belarusian people," Frey said. The Swedes' yearlong preparations involved learning how to pilot the three-seater Jodel aircraft and purchasing the plane. They financed the $184,500 cost of the stunt with their work in a small advertising agency. 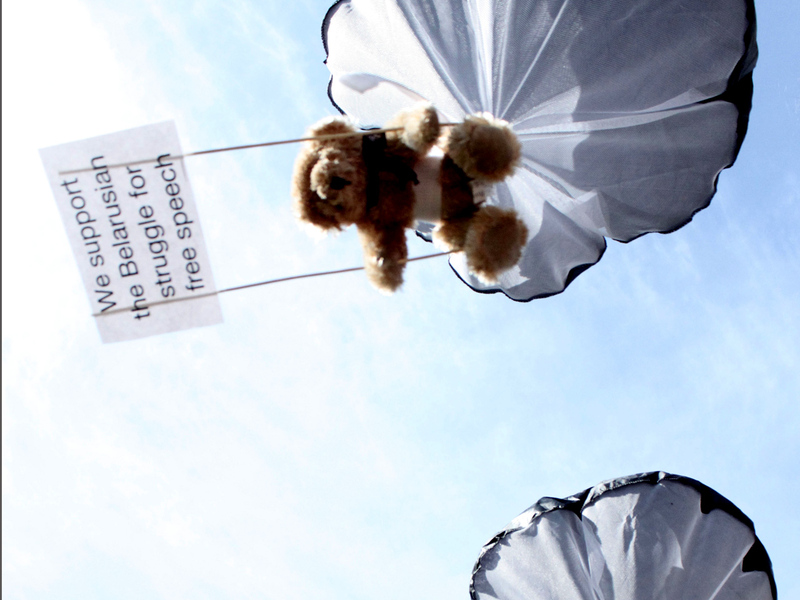 The pair said they were inspired by similar protests staged by Belarusian activists, who have at times arranged plush toys in such a way that they appeared to be protesting the regime. "Our campaign was a campaign in support of that. An airlift in support of the teddy bears, from teddy bears around the world," Mazetti said. The flight began and ended at the Pociunai airfield in southern Lithuania. Thunderstorms that day may have made it harder for Belarus to scramble aircraft to intercept their plane, said Mazetti, though he acknowledged they risked being shot down. "We flew an airplane at 50 meters, that's 150 feet, for one and a half hours inside Belarus. Of course we were aware of the risks. But it was a calculated risk and we thought we needed to take that risk ourselves - we couldn't hire anyone," he told The Associated Press during an interview in Berlin, where the two are currently staying. "But we will not do it again tomorrow, if I put it that way." Authorities in Belarus have also arrested a journalism student who posted teddy bear photos on his personal website and a real estate agent who offered an apartment to the Swedes. The two men were accused of assisting border violators and face up to seven years in prison if convicted. Lukashenko has ruled Belarus, a nation of 10 million, since 1994, stifling dissent and independent media. He also has boasted about the capabilities of a joint air defense system that Belarus has formed with Russia, saying it provides a reliable shield against purported threats from NATO. Valery Karbalevich, an independent Minsk-based political analyst, said purging the generals might be a way to save face in front of Moscow. The Kremlin may use the incident to try to put a Russian general in charge of the joint air defense system, he said. "It looks like Moscow is cranking up pressure and demanding an answer as to why the much-acclaimed air defense system is riddled with holes," Karbalevich said. Anatoly Lebedko, the head of Belarus' opposition United Civil Party, warned that Lukashenko may use the incident to crack down on dissidents in the run-up to a parliamentary election next month. In May 1987, another amateur pilot, Matthias Rust from Germany, made a similarly dashing flight into the closely-guarded Soviet airspace, landing his light Cessna plane next to the Kremlin. Soviet leader Mikhail Gorbachev responded by firing the defense minister and many other representatives of the top military brass.